May 9, 2017 Health & Etc. Dr. Madeline McClenney-Sadler says she leads a staff of 10 part-timers with a total annual budget of about $150,000. In a community of billion-dollar budgets, McClenney-Sadler’s Exodus Foundation appears to be hobbled by the dearth of support for helping the once-incarcerated to succeed on a path of reentry into society. McClenney-Sadler’s presentation was not about budgets. It was a call for volunteers and, more broadly, redesigning how society sets its wayward members on the right path. 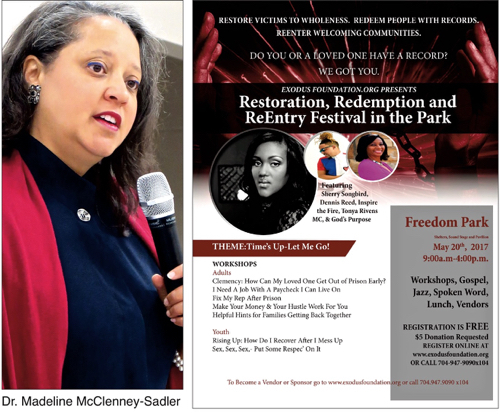 The talk was of redemptive justice, in collaboration with crime victims. The Q&A that followed the presentation was peppered with offers from Forum participants involved in other community organizations to collaborate in the work. In the video below, Dr. McClenney-Sadler’s presentation begins at minute 9:43. The Q&A begins at minute 32:00 and ends at 55:40.